William H. Johnson (1901-1970) was one of the great American artists of the 20th century. elements of a purely American drama which inspires and encourages anyone familiar with it. 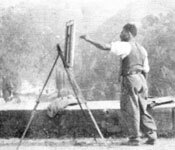 behind the formation of the William H. Johnson Foundation for the Arts. Turner, Steve and Victoria Dailey, WILLIAM H. JOHNSON: TRUTH BE TOLD. Powell, Richard J. HOMECOMING: THE ART AND LIFE OF WILLIAM H. JOHNSON.